Both teams are celebrating Summer Time with fun and colorful shaker cards using stamps from Sunny Studio and dies and embellishments from Studio Katia. There are prizes and a special sale too! Both companies have a prize to give away too do make sure you read all the way to the bottom of this post to see how to win! Hi everyone! Today I'm here along with a lot of other designers to participate in the Sunny Studio and Studio Katia Collaboration Blog Hop! Above is the order of the blog hop, since you'll need to follow along to be entered into the giveaways that are happening! For my card today I'm using the Magical Mermaids stamp set from Sunny Studio and the Dotted Patterns Set 1 Die Set (I know I called and named it differently in my video, that was the name I was told before it was released, so sorry!) and the Majestic Fusion Sequin Mix from Studio Katia. To begin my card today I first started with my frame for my shaker element. I used the Dotted Patterns die set to cut the outer rectangle frame as well as the bubbled frame to die cut out the centre, to have an open video for the shaker bits. Once everything was die cut I moved onto my background. I'm using some alcohol inks from Tim Holtz to create a fun ocean-sea themed background. I used three blue colours and dropped colour onto some Yupo paper. I then took some rubbing alcohol and sprayed it onto the background to create a bubble and blended effect. I dried it off a little with my heat tool and then set it aside to dry on it's own. Next up I used Copic markers to colour in the mermaids and other accents from Magical Mermaids and then used the coordinating dies to cut them out. I then added a piece of acetate onto the back of my frame piece with some double sided adhesive and then I added two layers of foam tape behind also to be able to have enough shake for my sequins. I also added my images on the front of the panel with the acetate with more foam adhesive and then flipped over the panel again to add more foam adhesive behind so the sequins didn't get trapped behind the images. I then removed the backers of the foam tape and adhered my now dried alcohol inked background behind the shaker panel. Next up I used a diagonal piece of blue cardstock and adhered it onto a card base and then adhered the shaker panel onto the front also. To finish up I white heat embossed the 'swimming by to say hi!' sentiment onto the same blue cardstock as used for the background and also adhered that with foam tape and added a hemp bow to the side to make it feel more grounded. Thanks so much for stopping by today, I hope you enjoyed the card and video! 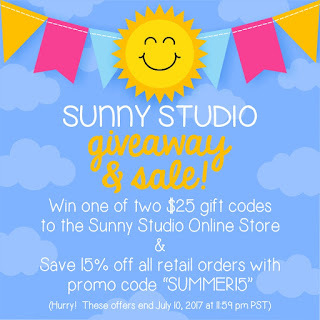 Also, Sunny Studio is having a sale! The next person on the hop is Kristina, go check out her blog also to keep on hopping! Adorable card. I agree, the sequin mix really adds to the magic. Great shaker card! I watch your YouTube videos all the time. I really enjoy them. Thank you. Love your card. The background is amazing. Thanks for including a video. I adore your amazing shaker!!! I myself love creating shakers. Such wonderful inspiration you have given today. Thank you!!! Just divine! Love the cute seahorse! Your coloring is beautiful. Love this shaker card and your coloring is beautiful! This is a very pretty and unique die. I like how you used it to create a shaker. The mermaid is so sweet. Hello, Eloise! Your card is beautiful and I am sure whoever receives it will absolutely love it!! The SK and SS products look fantastic in your design!! Awesome video and card, as usual. Fantastic coloring! What a beautiful shaker card...love the background and sequins. Thank you for the video : I did not know this coloring system for the background. The result is stunning ! Love the shaker card...so adorable! Wow, this card is amazing! Love, love, love it! Adorable. Love the colours and how you piled in the sequins. Beautiful card Eloise, I love you shaker cards and this one is a beauty ! Lovely coloring and great shaker card - I like the background very much! Nice Job! I know you love mermaids, you did a great job on this one too! Very pretty shaker card....Love this mermaids stamp image! This is a beautiful shaker card. I love the design, background, and pretty sequins. You colored everything beautifully!! What a beautifully designed shaker card Eloise!!! Love your coloring as always and you created such a fun card for a special someone! Love it! Ok. I'm officially uts for the lil seahorse. So cute. The sequins look like bubbles, so cute! Darling card! The sequins are perfect!! 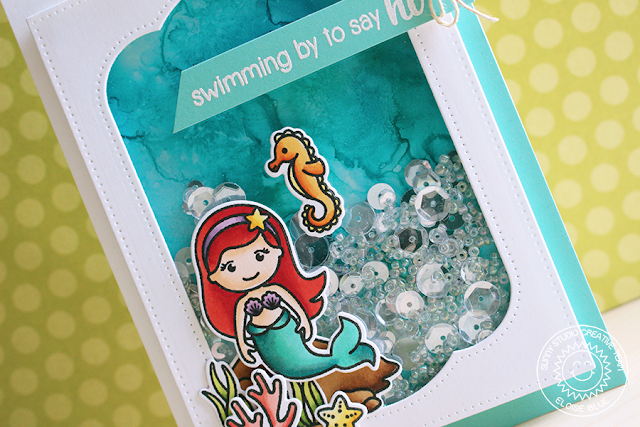 Very pretty mermaid shaker card! Beautiful coloring! your card is adorable. Such a cute mermaid and I love the sequins and the cute scene you created. Darling card! Love the coloring and background! The mermaid and seahorse are adorable, and I love the contour of the window opening! Awesome die! Beautiful! Don't you just love anything ocean related?! So so fun and cute! Awesome shaker card!! Beautiful colors!! Very....summer!!! Love your cards and videos. Love your shaker card. The majestic mixture is beautiful against the "water". Your backgrounds ROCK! Just fantastic work. I'll definitely be spending more time stalking your blog...you know, in a good way! Simply adorable shaker card!!! Love this! Gorgeous!!! I love the background you created, and those sequins are so beautiful! Awesome card. Love the cute little seahorse. Love the alcohol ink background, really sets it off! Super cute card! I love the background you created! Love Love Love this card! Thanks! Beautiful card. Love that window die. It's shape is gorgeous. And the stamp images are really cute. 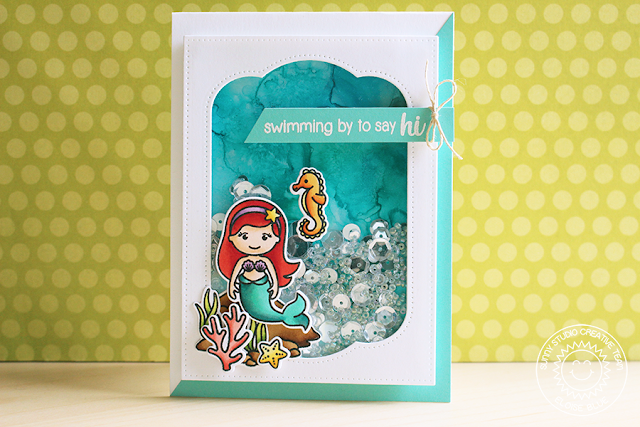 Love everything about this card - color, window, shaker, mermaid...everything! Yours is my favorite of all the cards in this hop. I just have to get this mermaid stamp set. This mermaid is such a cutie! Love how you colored it and the shaker style! Thank you for sharing! I really like your ocean card with the lovely mermaid! I especially like the diamonds! The little mermaid has stolen my heart! I love those mermaids. And the colors, wow. Love the fun sequins, this is such a great card! Wow your ocean background turned out great, and paired with the sparkly shaker elements, it's perfect! Love the shaker card and great video - do wish your type font on your blog was a bit larger and wish I could follow you via my Digg Reader!